When furnishing your care home, it is vitally important that you select flame retardant curtains and other soft furnishings. Not only is this a legal requirement, but it is also important when you consider the health and safety of your residents, visitors, and care teams. Here at Hill & Hill, we provide a gorgeous and practical range of flame retardant curtains for the care home and hospitality industries. When you choose us to provide your care home curtains, you can rest assured that you are choosing a high quality and cost effective option. We have decades of experience in designing and creating stylish and practical furniture and furnishings for the care home setting. Furthermore, due to the high standards of our furnishings, they are incredibly popular in the leisure and hospitality industries. They have been used in hotels, holiday homes, and care homes up and down the country; take a look at our case studies. As many of our fabric choices have been graded with help of the Alzheimer's Society, they are even suitable for use in specialist dementia care centres. Moreover, once you have made your fabric selection, we can create a range of co-ordinating items. In addition to our flame retardant curtains, we can also provide cushions and bed linen; we can also upholster furniture in matching fabrics for a well-put-together look. Our flame retardant curtains and furnishings are created in our workshop by our highly experienced team of seamstress and sewists. They meet health and safety guidelines, and will exceed your expectations in terms of quality. 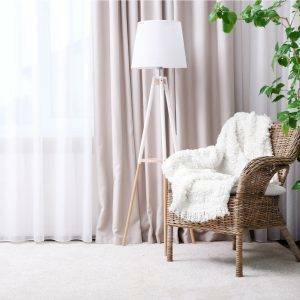 If you are looking for stylish, high quality flame retardant curtains and furnishings, please don't hesitate to call us. We are always happy to discuss your options, and offer any help and advice you may need. You can view examples of our soft furnishings and furniture here, perfect for giving you some ideas and inspiration!